Eticket4 is an international secondary ticketing platform developed by Israeli entrepreneurs in 2015. In the fourth quarter of 2018 Eticket4 is introducing blockchain-based functionality and new loyalty reward system based on ET4 crypto tokens. In the Eticket4 ecosystem an investor is the subject who is interested in the long-term growth of the ET4 token rate. The investor can also act as a platform participant, e.g. the event organizer, the ticket broker or the ticket buyer. Buyers can cover up to 100% of the ticket price with tokens. Eticket4 platform requires commission of 2% when using tokens as opposed to 30% when using fiat. From each transaction 1% will be charged to pay the miners for the transaction and another 1% will go to either the Platform Development or the Lottery fund. Customers will be rewarded with ET4 tokens for the best match results prediction. Once tickets are successfully used the buyer receives 10% cashback in tokens. For World Cup tickets the token cashback volume is 20%. With a balance of more than 1,000 tokens, the ticket broker gets access to advanced analytical tools and ticket price forecasting features. Ticket brokers that receive ET4 tokens as payment can at any time exchange tokens for fiat money by selling ET4 on crypto exchange or on the internal Eticket4 exchange with 20% commission. With a balance of more than 10,000 ET4 the event organizer can regulate the secondary ticket market through smart contracts, e.g. 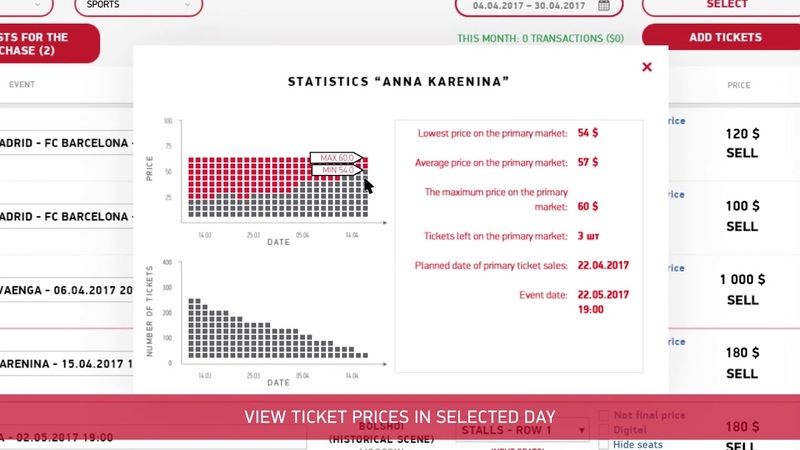 set price and volume limits on the tickets issued via Eticket4 platform, receive commission from secondary market transactions. To launch the reward campaign for social media activity, check-ins at the event venue and reviews, the organizer must have a reserve of tokens to guarantee the fulfillment of obligations. Creating a concept for Eticket4. Prototyping. Eticket4 Web Platform development ($250 000 invested). Eticket4.ru & Etickеt4.com launch (2500 Deals, 5 000 Tickets sold). Eastern Europe and CIS countries markets entry during FIFA Confederations Cup 2017 ticket sales period (32 000 Deals, 60 000 Tickets sold, $2 000 000 Turnover). Paid Analytics tools launch for ticket brokers. Introducing API for data exchange. International shipping services integration. Opening outlets in countries participating in World Cup 2018 Spanish, Portuguese, German and French versions of Eticket4 website launch. Development and introduction of new business process management approach based on blockchain. Development and launch of ticket exchange for brokers with forward contracts functionality. Eticket4 is an online ticket marketplace facilitating P2P transactions. The mission of the service is to reduce malpractice on secondary ticketing market through introduction of a blockchain-based functionality. You can send Ether to our Etherium address from Ethereum-based wallets (e.g. Mist, MyEtherWallet or MetaMask). The ET4 tokens will be distributed after TGE is finished. You can store your ET4 tokens on your Etherium-based wallet or you can deposit them to Eticket4 platform with no commission. How will I benefit from investing in ET4? As an investor, you can get up to 30% off tickets sold on the platform (if you're a buyer) or access advanced functionality to get the most of selling process (if you're a vendor). You can also buy tickets during pre-sale. How large is the market for Eticket4? Secondary ticketing market is about $8 bn. large (worldwide) and it rapidly grows at CAGR 19%.